inspired a discussion on rationing with a group from John Mason School. 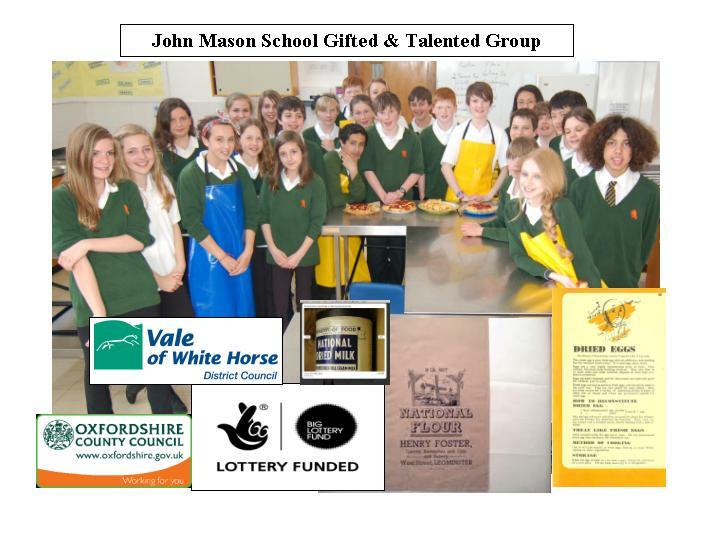 Following this on Thursday 19th April the Gifted & Talented group at John Mason School embarked on a cookery project. tin and bake for 15 – 20 minutes. with jam or custard sauce. The cake was given to members of the Centre to try and see if it was how they remembered cakes tasting at the time. I am still interviewing individual members who are kindly sharing their memories of time gone by. We have spoken of those who managed to get away from the islands before the Germans arrived. Many remember leaving on boats with only a suitcase with them. Others recall losing their homes when they came up from the Air Raid shelters and found their homes had been bombed. They spoke of being put up in a church until such time as they were found other accommodation. These are funny, sad intriguing stories and only wish I could spend longer on these very short films. We have more that will be taking place over the next six months. Artist Helen Jacobs will be running workshops in June & July. Co--op Archives Anne Ransome will be visiting, Helen Fountain and Gill Munday from the Museums, Cait Sweeney will be looking at the Stars from the Golden Screen. While Isla Goldsmith runs the tabletop plants and gardening session and we look at the ‘Dig For Victory’ campaign. Down Memory Lane is funded by The Awards For All Grant – Lottery Fund. Pauline Krason, Pat Taylor, Jean Abraham, Sarah Holloway, Lina Mokute, Christine Sadler and Jackie Richards. Sharon is an award winning film-maker, with thirty years of production experience. First break in television was in 1984 with the new Channel 4's Eleventh Hour, Youth Series 'Turn It Up'. Sharon went on to train at Newport Film School, The National Film and Television School and in the cutting rooms of BBC Wales and Tyne Tees Television.